Suggested Use: One capsule up to 3 times daily with a meal or as directed by a health care professional. 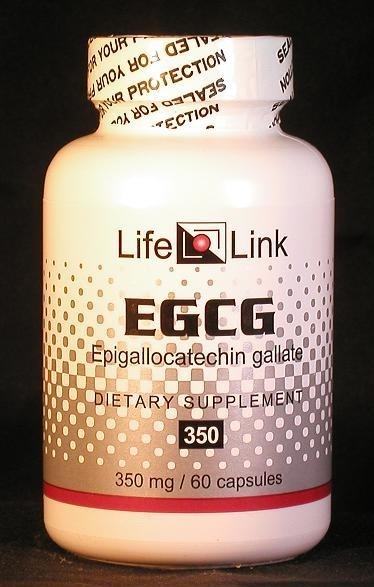 EGCG stands for ‘epigallocatechin-3-gallate’, a substance that falls into a chemical category called ‘catechins’. EGCG is the most abundant catechin found in tea. other viral and bacterial infections, including dental infections. When consumed with food, EGCG is absorbed poorly and is cleared quickly from the blood. This is why the amount of tea that must be consumed in order to achieve beneficial effects is quite high — many cups of tea per day. The supplement form of EGCG gives you far more EGCG than you can get by drinking any reasonable amount of green tea. And by taking piperine supplements in addition to EGCG, you block enzymes that prevent EGCG absorption as well as those that metabolize EGCG once it is in the body. Accordingly, we will limit our discussion of EGCG to a brief summary of relevant research, and let you draw your own conclusions about what medical conditions it may be effective in treating. You might wonder why a single substance should have such broad applications in the body, while other familiar medical substances (such as Prozac) have much more limited effects. The reason has to do with the mechanisms by which these substances work. EGCG has a broad range of actions because it interferes with the chemical signals cells use to communicate with each other — signals that are involved in all of the above ailments. Drugs like Prozac, on the other hand, interfere with processes that affect mainly the activity of brain cells. Prescription drugs are carefully chosen for their specificity and government regulatory agencies nix candidate drugs that have wide-ranging effects. Supplements, on the other hand, are often chosen for their wide-ranging effects — why settle for just one benefit if you can have several for the price of one? Why does EGCG have a beneficial effect for these diseases? One reason has to do with EGCG’s effects on iron atoms in the brain. Iron has a known association with neurodegenerative diseases:5 it promotes the oxidative damage of nerve cells, and appears to play a role in maintaining plaques of ‘amyloid-beta’ protein in the brains of Alzheimer’s patients. Laboratory experiments have shown that EGCG has strong iron-chelating activity11 — that is, EGCG readily removes iron atoms from in and around brain cells. High blood pressure is a condition which in itself has few symptoms. But the damage it causes to the body has significant symptoms indeed. These include: heart attacks • strokes • kidney failure • eye damage • peripheral arterial disease • aneurysms.31 Methods for preventing high blood pressure are therefore valuable contributors to health. “Recent data from human studies indicate that the consumption of green tea and green tea extracts may help reduce body weight, mainly body fat, by increasing postprandial thermogenesis and fat oxidation.”35 In other words, these substances increase the rate at which the body metabolizes fats after a meal, and cause the body temperature to rise. When consumed with food, EGCG is absorbed poorly and is cleared quickly from the blood.24 It therefore has poor bioavailability under these conditions. This is why the amount of green tea that must be consumed in order to achieve beneficial effects is often found to be quite high — many cups of tea per day. Is EGCG useful for the conditions and purposes mentioned above? We aren’t allowed to tell you, so you should take a look at some of the references cited here, and then decide for yourself.